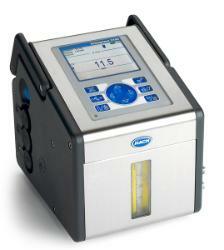 When using dissolved oxygen measurement, the TPO can be calculated from a shaken package. To do this calculation you also need to know the headspace volume, liquid volume, and the package temperature. The temperature and the headspace volume are critical values, and small inaccuracies can alter the results significantly. But, the liquid volume may be estimated by using the average fill volume. Once you have your figures, you can use our TPO calculator to determine the concentration from your initial DO2 measurements. Fill out the form to receive a copy of our TPO calculator. Whether you need a portable dissolved oxygen analyzer or an inline sensor that measures high and low level oxygen measurements, Hach has you covered. ALWAYS IN EXPERT HANDS: Your Analytics Partner.